A couple of weeks ago I attended one of the most horrifying youth basketball games I’ve ever watched since the time I began coaching. I won’t specify where it was or which teams participated, but I will give you the details so that hopefully others can learn from them. I entered the gym as a U12 girls game was about to commence. I’m assuming it was a grand final since the stands were near completely filled. There were numerous banners being held up and many of the spectators were dressed up in the colors of the teams warming up on the court. A little over the top for a U12 basketball game, but at the time I didn’t give it too much thought. It wasn’t until the game had started that the true horrors of what youth sports can turn into became clear. Every time a team would score (or do anything positive), the parents and fans would go crazy. Cheering. Stomping their feet. You name it, they did it. At the same time, the opposing team would be just as quick (and loud) to boo the success of the U12 female athletes on the opposition team. This continued for nearly the entire first half. With approximately a minute left, the referee made an obvious bad call that resulted in one team being rewarded with two free-throws. As many in the stands loudly voiced their opinion on this call, one of the opposition parents sitting behind the bench was so unhappy that he decided to throw one of their team’s banners onto the court out of anger. Some of the people around him were quick to calm him down and retrieve the banner, but that was enough for me. As far as I’m aware, there were no fights between the spectators, no tears were shed by any of the players, and no one was thrown out of the game. Was the game I witnessed as bad as youth sports parents get? Definitely not. 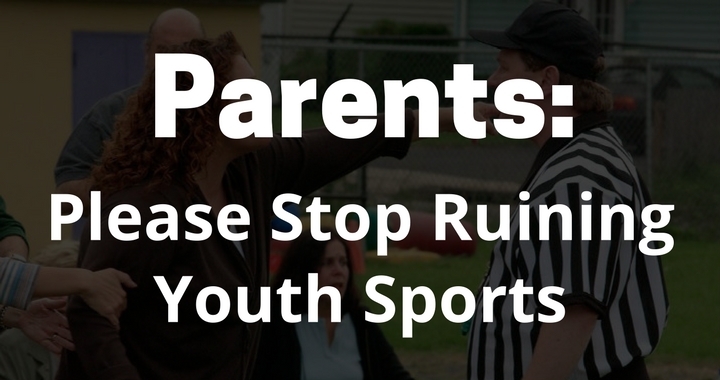 Was it uncommon behavior for youth sports parents? Definitely not. Witnessing these scenes encouraged me to elaborate on my thoughts regarding parents involved with youth sports and what changes they can make to improve the youth sporting experience for the players. • We have coaches to coach the game. • We have referees to referee the game. • We have players to play the game. • And we have spectators to spectate the game. A parent’s role consists of watching the game and providing support for your child and the other players on the court. ‘Providing support’ does not mean screaming out to the players, throwing your hands in the air when a player makes a mistake, or displaying terrible body language. I know it can be a rollercoaster of thoughts and feelings watching your kids competing against other kids, but parents must be able to control their emotions. Reiterating my point above, your role at the game is to watch and enjoy the game; not to coach. By all means, if coaching is something that you want to pursue there are many clubs all over the world who are constantly looking for coaches of all levels. I encourage you to sign up. 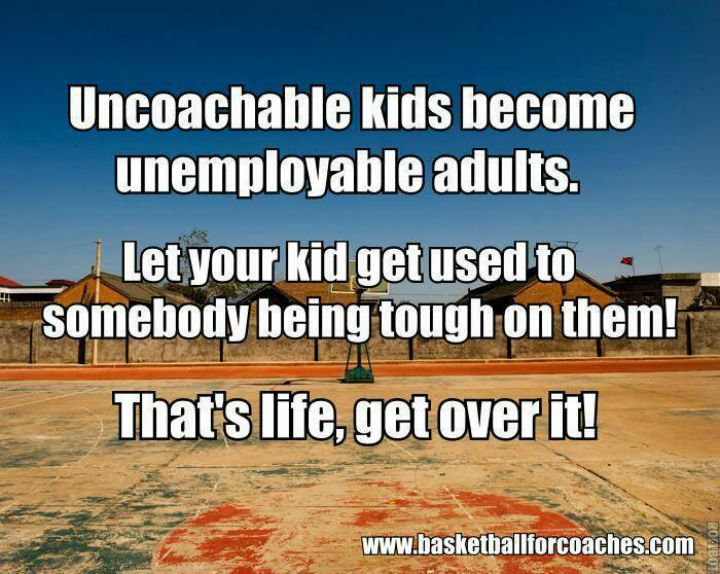 But if you’re attending a game as a spectator, do not coach your child or any other players from the sidelines. The reason this is detrimental to your child and the rest of the team is because they’ll be receiving conflicting messages from you and the coach. Youth sports is a fantastic opportunity for players to learn how to deal with their emotions and experience failure in a safe environment. Yet despite their good intentions, too many parents are unknowingly robbing their children of experiencing and learning these incredibly important life lessons. Adults need to stop springing to the rescue and ‘saving’ their child every time something negative happens or the child feels a little upset. The children participating in youth sports today are a product of the environment we’ve created and raised them in. Youth players are fully aware that if they’re upset about something, their parents will save them from it. And most take full advantage of this fact. We must change our ways and allow players to experience and learn how to deal with emotions and how to handle failure. It won’t kill them, I promise. There’s nothing that will kill the respect and trust a child has for their coach quicker than a parent undermining the coach’s decisions. 1. Validating that the coach is wrong. 2. Putting negative opinions in the player’s head. By having conversations like these with your son or daughter, you’re increasing the chances that the player will stop listening to the coach. You can be sure that these words will be passed out to the other players, too. The reason that many parents have these conversations with their children is in an attempt to shift the blame that players are putting on themselves. If the child is upset, parents believe they’re helping their child by blaming the coach and taking the burden off the player. While this might help them in the short-term, it definitely won’t help the team or the individual player long-term. But if you have concerns or disagree with something the coach is doing, you should be discussing that with the coach. I’ll start this section of the article by making it clear that this is assuming your child’s coach is coaching them from a place of love and a desire for them and the team to improve. There are many coaches in the youth sports world that simply don’t know how to teach or connect with their team. Some can go so far as to bully their players. Screaming in a 6-year-olds face about a mistake they made is not good coaching no matter how many times some coaches will try to convince you it’s ‘tough love’. Therefore, this section may not apply to all situations. With that said, there are also far too many parents who ‘baby’ their children and jump to their defense whenever a coach attempts to hold them to high standards. You must allow your players to be coached. If a player isn’t living up to the standards of the team (lack of effort, not listening to the coach, going against the game-plan, bullying teammates, etc), it’s part of a youth coach’s role to demand better from the player. A coach must be able to address the player on these issues in a kind way that doesn’t make the player feel threatened, but also demands respect and shows that the coach is the authority. Kids aren’t used to adults holding them to a high standard. When a coach does attempt to hold them to a high standard, players can sometimes react negatively and feel like they’re being treated unfairly by the coach. After telling their parents, the parents are quick to label the adult holding their kid to a high standard a ‘terrible coach who has no idea what they’re doing’ instead of finding out what actually happened. This is often followed by a heated exchange between the parent and the coach or an immediate appeal for their child to be transferred to another team. As long as the coach is doing it the right way, a coach must be able to hold the players to the high standards set by the team. • Success requires hard work. • The importance of body language. • How to win/succeed with class. How can a coach help teach players that success requires hard work if they can’t tell the player then need to be giving more effort? How can a coach help improve a player’s body language if they can’t correct the player when they display poor body language? Each year, more and more parents are being persuaded to have their son or daughter specialize in a single sport for the entire year. The main argument that many coaches use to convince parents and players to commit is by telling them that if they don’t, they’ll get left behind by those who do specialize. This isn’t only a blatant lie, it’s also potentially dangerous. I don’t blame parents for believing that specializing in one sport is the best thing to do for their child at the time without having looked at the research. Especially after the child has shown some natural ability in the sport. In fact, on the surface, it sounds like a wise decision! By specializing, more time practicing, playing, and improving their abilities can only lead to positives for their basketball future, right? Many people even cite the 10,000-hour rule from Malcolm Gladwell as a reason why their child doesn’t have time for other sports. • Mental burnout and stress. • Increased chance of injury. • Build relationships with peers. • Experience different coaches and coaching styles. Doesn’t sound so great anymore, does it? It’s up to parents and coaches to encourage multi-sport participation because players aren’t aware of the negatives that will inevitably become more and more clear over time. • Tim Duncan, arguably one of the top 10 players to ever play in the NBA, was an incredibly talented swimmer and had aspirations to compete in the 1992 Olympic Games. • Hakeem Olajuwon didn’t play a single game of basketball until he was 15 years old choosing to play soccer. • LeBron James was an all-state wide receiver during his sophomore and junior years of high school. • Elena Delle Donne went so far as to quit playing basketball due to burnout for the first year of college before returning and going on to be the WNBA Rookie of the Year in 2013. 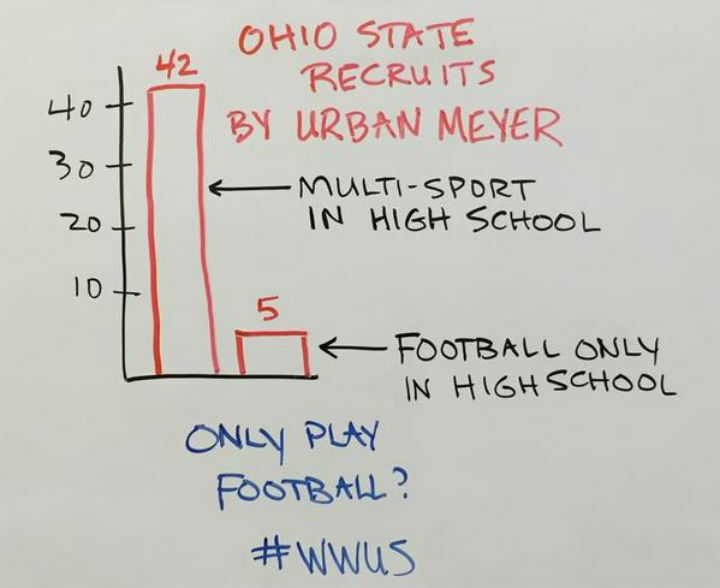 The image below shows that of the 47 football players Urban Meyer recruited to Ohio State, 42 of them were multi-sport athletes during their time at high school. A parent signs their child up for a sport and quickly notices that they seem to have a fair amount of natural talent. Coaches start approaching and praising their son or daughter’s abilities and encouraging you to sign them up to travel teams, elite basketball camps, and enroll them in personal training. • Playing division 1 basketball. • Potentially playing professional basketball. I don’t mean to burst anyone’s bubble, but only 3% percent of players go on to receive a scholarship and 0.02 – 0.03% of players will end up in the NBA or WNBA. That’s 2 – 3 out of 10,000 high school basketball players. It’s far better at the youth sports level to simply allow the child to enjoy the process, encourage them to play multiple sports, and support them in what they choose to do instead of putting the pressure on them to score themselves a free education. It will save you and the player a lot of stress. Finances are a topic I hesitated to touch on, but in the end thought it was far too important to leave out. As we are all well aware, youth sports can be incredibly expensive. In fact, in this article from FlipGive, studies have shown that parents can end up paying as much as $5,500 a year when participating on a travel team. And I’m sure there are a lot of parents who spend much more each year. New equipment, fees, travel costs, accommodation, etc. These all add up very quickly! Naturally, this puts a lot of stress on the parents who are digging deep into their pockets to pay for the experience. The bigger problem occurs when this stress is transferred to the players. Numerous times I’ve witnessed parents directly telling their kids that they had better perform well or everything the parents have spent on the sport will be a ‘waste of money’. Take a second to think about the pressure that this puts on a player! No wonder players burn out and quit at such a young age. Please remember: Your kid’s youth sporting participation is not a financial investment! You should never expect a single dollar back from the money you put into the youth sports experience. Are travel teams 100% necessary? No. Are personal trainers 100% necessary? No. Is having the latest equipment 100% necessary? No. Don’t add these unnecessary costs to your finances unless you can comfortably afford them. First off, I want to acknowledge that 99% of parents have their heart in the right place. They push their children to train and perform because they want them to have the highest possible chance of succeeding. They encourage or allow them to specialize because they believe it will give them an edge over their competition. They protect their children by shifting blame to the coaches, referees, or even quality of the facilities. Unfortunately, most parents aren’t aware that many of their actions aren’t in the best interests of the players and can even negatively affect their chances of future success. Going forward, we all need to put a bigger focus on putting the needs of the players first.